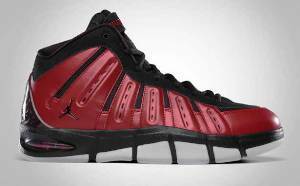 Denver Nuggets forward Carmelo Anthony is still a fixture in all trade rumors in the NBA right now, and he is set to get more attention this month after the Jordan Brand announced the release of the Varsity Red/Black-White edition of the Jordan Melo M7. The new-look Jordan Melo M7 boast a solid varsity red color adds a lot of fire in of one of Carmelo Anthony’s most famous shoes to date, and it seems to be an improved version of the university blue edition that was released last month. The new edition of the M7, which features a solid black midsole that sits on an air unit and a white outsole, is set to hit the market this month and it is expected to be another hit with it impressive design and performance-based excellence.